This problem comes up when you try to flush your old brake fluid with new fluid. Some of you may have done this job without any hangups , some of you might have solved this problem by buying vacuum pumps or air driven evacuators, yet others gave it up and took it to someone like me. The same basic system is used in the front brakes, rear brake as well as hydraulic clutch actuators. So you try to bleed the old fluid out and replace it with fresh fluid and in the middle of pumping, you realize that you forgot to check the reservoir and now have air in your system? No matter how much or how long you bleed your brakes, you may never get all the air out of the system. Sometimes even a vacuum pump won't help. But there is no need to run out to the store and spend money on any more tools. No matter how much vacuum you apply, sometimes air remains trapped in the passages inside the cylinder. this pocket of air does not pass through the lines and out of the caliper bleeder screw. it sits at the top and will continue giving you the same problem - no firm brake handle. 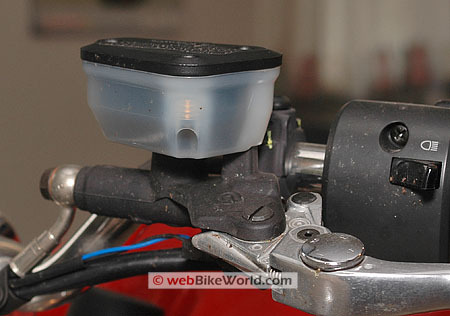 (newer systems have bleeder screws built into the master cylinder, making the whole process much easier). 1. Loosen the banjo bolt connecting the brake line to the master cylinder. 2. remove the banjo bolt from the cylinder. 3. pour fresh brake fluid into the reservoir. 4. put your finger over the hole where the banjo was attached, effectively covering the opening. 5. pump the lever slowly. you will feel pressure on your finger every time you pump. 6. allow the fluid escape past your finger, but keep enough pressure on the opening as to not let any air back in. 7. when you feel that no more air is coming from the cylinder and only brake fluid, grab the brake line by the head of the banjo bolt and quickly release your finger and thread in the bolt all the way in. 8. tighten the banjo bolt to the specified torque. ___b. with the bleeder screw closed, pump 3 to 5 times, in a smooth, slow motion to build up the pressure. ___c. on the last pump, hold the lever down and open the bleeder screw. while the fluid is still coming out, close the screw. you will get better at this the more you do it. ___d. repeat as many times as necessary to ensure that no air remains in the system and tighten the bleeder screw. ___e. check the brake feel after bleeding and then 5 minutes later. if any air remains in the system, you will feel it after some time has passed. ___f. for front brakes, bleed each caliper separately. you may need to alternate between the calipers several times to rid the brake system of all the air. ___g. be sure to thoroughly clean all surfaces. I take it one step further and take Q-tip sticks, take off most of the cotton off the end and dry out the inside of the bleeder screw. Remember, brake fluid is hygroscopic, which means it will attract water and cause rust. Those who have ever had to junk a caliper because the bleeder screw cannot be opened know what I am talking about. Be sure to be prepared for a bit of a mess when dealing with brake fluid. have plenty of rags available and place them so that the fluid can simply drip down on the towels. I use old bathroom and beach towels, they are very absorbent and are great for clean up. Last edited by alpiniste; 01-10-2010 at 09:14 AM. Might be a really dumb question , but I don't want to damage anything else - When you disconnect the brake line from the master cyclinder, are there any prereqs such as removing the top on the master cylinder? When bleeding, the top is supposed to be off of the master cylinder right? So that you can continue to add fluid? I didn't have any problems changing the pads but since I have changed them (00 F4) the front brake is extremely spongy, to the point where the lever touches my knuckles without much of an attempt. Half way through, I thought I remembered that I was supposed to take the reservoir top off and did so. Maybe that was the issue??? Hmmm... interesting concept! I'll try this sometime soon as my brakes are slightly spongy and I just can't seem to kill it no matter how many times I bleed the system! For in garage service, buying a die-cast METAL vacuum pump was a purchase I do not regret. A good tip as well as priming the master cylinder by undoing the banjo bolt from the master cylinder if you still have air in the system after filling the banjo entrance up with fluid, leave the banjo on the master slightly lose enough so it leaks fluid. Now you will need a second person here and you want him/her to push on the calipers forcing fluid and air up towards the master, at the same time depress the break lever and have your spanner at the ready as soon as you see just fluid coming out tighten the banjo back up. Then slowly pump the lever ( not all the way 80%) this will have got all the air out of the lines and calipers. Check the level on the master reservoir and top up to mark if need be. You gotta prime that master cylinder believe me if your having trouble! If you still get a soft lever get a seal kit and rebuild the master cylinder. Same goes for the rear break.